Sunny Georgia attracts foreigners not only with grand architectural monuments and cozy atmosphere but also with excellent investment opportunities in business. Clear evidence of this is the sixth rank of Georgia in Doing Business report where it outpaced such strong competitors as Greece, Spain and even Italy. Nobody can give insight to entrepreneurship deeper than people who are directly dealing with it on daily basis. 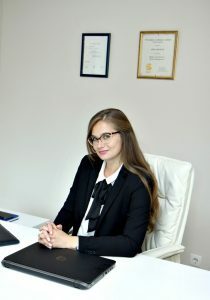 Ella Lekishvili, Country Manager of the company’s branch in Georgia, is one of such experts. Is it really simple and easy to establish business in Georgia? What is the reason? Yes, it is. One window principle is thoroughly observed in Georgia which allows to register a new entity in the House of Justice within just a day. This approach makes the country one of the best investment options and in 2018 Georgia successfully ranked the sixth in Easy Doing Business report. Do registration procedures for local and foreign citizens differ? What are possible pitfalls to be aware of? There are no differences between requirements for locals and foreigners. The main point is accuracy of submitted documents prescribed by the House of Justice. Start up capital size is not disclosed either. What business activities require special permission (license) and where to get full information, for example, for opening a rehabilitation centre? Clear and full list of business activities that require special document (license) is specified in the effective License and Permissions Law. First, these are construction, healthcare, energy, communication and gambling sectors. Both locals and foreigners can request permission. What are recruitment practices to hire qualified personnel for the new enterprise? What possible solutions can you advise? It is quite uneasy to find good staff that will be able to generate income soon after incorporation. The most common advice is to approach experienced recruiting companies that have good knowledge of the local labour market. Head hunting is always an option – chasing top level specialists and trying to entice strong professionals. The latter is most relevant in the strong competitive environment. What are differences between a full time accountant and outsourced accounting services? What is the best solution and why? For small companies outsourcing is the best solution, as skilled professionals have grasp of the current legislation and experience in various sectors. It ensures accurate tax reports and saves money on rent of additional premises and costs of keeping a full time accountant. Besides, outsourcing allows for possible risk sharing. The full time accountant and even a full scale financial section are more relevant for corporations with a large personnel and multiple financial settlements. What is the exact meaning of the notion “profit tax is replaced with the tax on dividends” and how relevant is it for modern Georgia? According to the current draft, since 2017 a businessman has to pay tax only if the profit is distributed as dividends of shareholders. But if the generated income is reinvested (e.g., to expand production or upgrade equipment), the enterprise is exempt from such charges. Is a business closure also an easy and prompt procedure? Are there any cases, when this is simply impossible? Business closure procedure may be a bit longer (compared to incorporation), as it requires verification of data with the tax authority. As a rule, good management practices prevent issues with the business closure. Decision to shut down a company cannot be observed, if the legal entity has payables or receivables, or if some shareholders disagree with that decision. When is it a good solution and what are its weaknesses that foreigners need to know in advance? Outstaffing becomes increasingly popular in Georgia with every passing year. After all, the option to hire someone while avoiding time consuming personnel recruitment, contract conclusion, various money transfers is quite a good solution for large trade companies. Another important strength is an opportunity to study market trends in advance and adequately assess all potential prospects prior to opening the company. Georgia is different from others with free industrial zones (FIZ). What are special procedures there and how do they differ from legal provisions effective in the rest of the country? There are several FIZ in Georgia. They offer tax privileges for businesses as well as settlements in any currency. Payments can be made not only within and between industrial zones but also throughout the whole country. Additional benefits are lower power charges and rental fees. Can you give examples of success stories about FIZ in Georgia? First discussions about creating free industrial zones were in 1992 right after retrieving national independence but implementation was postponed several times for different reasons. Particular reasons were rivalry of various political forces in the country which alleged that such option would create undue competition to domestic enterprises through expanded shadow economy and thus, will not bring any benefits to Georgia. The draft law on free industrial zones was adopted just in 2007. Since then five such zones were created: Tbilisi, Batumi, two in Poti and two in Kutaisi. The main provisions of the draft law are area limits for FIZ (they should not exceed 10 ha) and existence of customs checkpoints with thorough control of all entries and exits. FIZ offer simplified business licensing procedures but require that office premises must never be used for housing purposes. So, FIZ history in Georgia has just up to ten years but clear strategy has already made the country one of the top international investment locations.